We are a leading Exporter of 3.5 mm small t plate, t plate 4.5 mm, volar locking plate and small t- oblique plate from Ahmedabad, India. 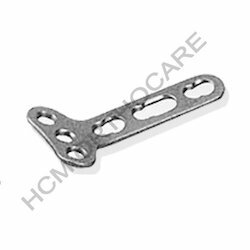 We are regarded as well-known manufacturers, suppliers, and exporters of a broad assortment of premium quality T Plates including 3.5 mm Small T Plate that is used while surgical fixation of fractures. These are made by using the finest grades of metal alloys and are subjected to rigorous quality checks that are in adherence with well defined norms of industry. We use high end technologies to manufacture these plates in our state of the art manufacturing facilities. 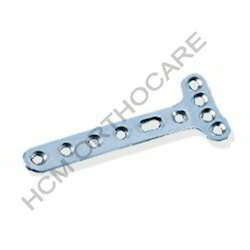 Our range of T Plates is appreciated by leading Surgeons and Orthopedics across the globe for unmatched performance. We offer these at industry leading prices. 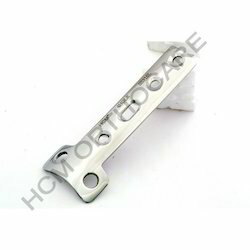 Our expert group assist us in manufacturing and supplying a superior range of T Plate 4.5 mm . Our range of product is highly recommended by orthopedic surgeons in various hospitals, clinics and nursing homes across the world. Backed with cutting edge technology and industrial experience, we offer a distinctive range of Small T Plate 3.5 mm with Locking System. 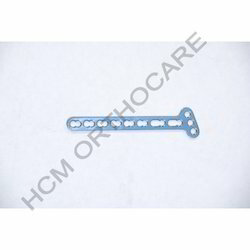 We are reckoned as reputed manufacturers, suppliers, and exporters of a broad assortment of premium quality T Plates including Small T- Oblique Plate that is used while performing orthopedic fixation surgeries. These are made by using the highest grades of alloys and are subjected to stringent quality checks that are in line with well defined standards of industry. We use cutting edge technologies to manufacture these implants in our ultra modern manufacturing facilities. Our range of implants is highly acclaimed by leading Surgeons across the globe for their outstanding performance. We offer these in different number of holes and materials at industry leading prices. Looking for T Plates ?